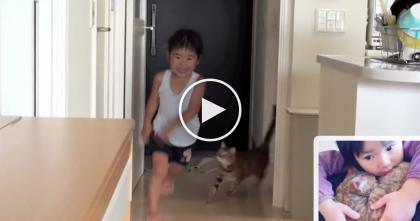 Ginger Kitten Finds His Favorite Place In The House, But Then At 1:27… OMG, Too Cute! This sweet little kitten found a slipper and he loves hiding inside of it. He’s such a tiny little thing that he fits ‘purrfectly’ inside the little slipper and enjoys the comfort more than any other place in the house! You can see that it’s too comfortable to even stay awake, he goes to sleep siting up in his little slipper chair, it’s the cutest thing ever! 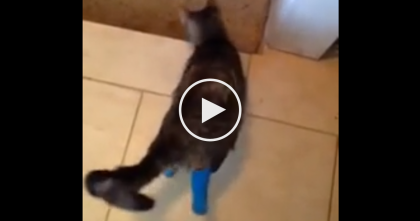 Kitty Wants Some Love From His Human, But Now Watch What The Cat Does With His Paw… SOO CUTE. They Rescued This Abandoned Deer, But Then…They Didn’t Expect That To Happen! 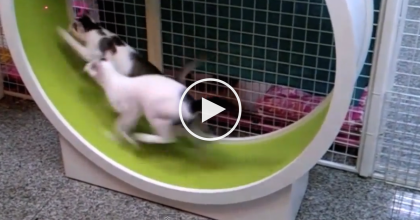 They Needed Some Exercise, So Watch What They Got The Cats, It’s Just GENIUS.